Item #13963: 18Kt. Yellow Gold ring with 5.1mm round Burmese Ruby set in White & Yellow Gold. Size 6 1/2. Item #AG-X4HR68R: 14Kt. Yellow Gold circle brooch with twelve 6mm round "AA" Quality Akoya Cultured Pearls and four Rubies of .32 Cts. TW. Item #AG-4H67R: 14Kt. Yellow Gold brooch with five fine quality 7mm round Akoya Cultured Pearls and four square Rubies of .44 Cts. TW. Item #AG-8M46R: 14Kt. Yellow Gold dangle earrings with four 8mm round "AA" Quality Akoya Cultured Pearls, four round Rubies of .40 Cts. TW and two round Diamonds of .10 Cts. TW; Post backs. 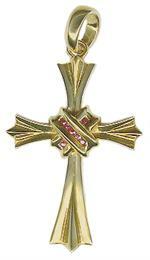 Item #AG-4H31R: 14Kt. Yellow Gold pendant with one 8mm round Quality Akoya Cultured Pearl, two round Rubies of .20 Cts. TW and one round Diamond of .05 Cts. Item #GSJ-2372: 18Kt. Yellow Gold Earrings with two prong set 4x5mm pear shape Burmese Rubies of 1.00 ct. TW and twenty prong set round Diamonds of .68 cts. TW; Post backs. Item #TBM-26030: 18Kt. White Gold Pendant with one 4.4x4.4mm cushion Burmese Ruby of .52 cts. and round Diamonds of .31 cts. TW. Item #15703: 18Kt. Yellow Gold ring with two 3.4mm round Rubies of .41 Cts. TW and 6.3x6.1mm off round Ceylon Blue Sapphire of 1.48 Cts. set in White Gold. Size 7 1/2. Item #AP-S8P25R: 14Kt. Yellow Gold Earrings with two 13mm heart shape Mabe Cultured Pearls and two 3mm square Rubies of .60 cts. TW; Post and clip backs. Item #AG-4P25R: Lady's 14Kt. 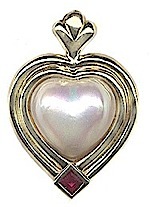 Yellow Gold Pendant Enhancer with one bezel set 13mm heart shape Mabe Cultured Pearl and one bezel set 3mm square Cut Ruby of .30 cts. Item #RCK-2146/PC/R: 14Kt. 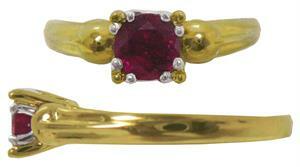 Yellow Gold hinged bangle bracelet with six 2.4mm square Rubies of .52 cts. TW, five 2.5mm princess cut Diamonds of .48 cts. TW and side safety. 2 3/8" inside diameter. Item #BK-05090: 7.5" long, 14Kt. White Gold Bracelet with thirty-one 3x4mm ovals Rubies of 7.25 cts. TW and thirty-one round Diamonds (G/VS1-2) of .60 cts. TW; Slide clasp and safety. Item #CSJ-1370: 18Kt. Yellow Gold earrings with 4x6mm oval Rubies of 1.21 cts. TW, twenty-four round Diamonds of .27 cts. TW, eight tapered baguette Diamonds of .09 cts. TW and post & clip backs. Item #15284: 14Kt. White Gold Lady's Ring with three round Rubies of .60 cts. TW and two round Diamonds of .30 cts. TW; Size 7 1/4. Item #16814: 14Kt. White Gold Lady's Ring with 4mm square Ruby of .36 cts., eight channel set princess Diamonds and ten channel set baguette Diamonds of .25 cts. TW; Size 7. Item #11555: 14Kt. Yellow Gold lady's band ring with four emerald cut Rubies of .31 Cts. TW and three emerald cut Diamonds of .20 Cts. TW. Size 6. Item #15698: 18Kt. White Gold Ring Lady's Ring with 6mm Round Ruby of .78 cts., six Round Diamonds of .35 cts. TW and thirteen Tapered Baguette Diamonds of .35 cts. TW; Size 6 1/2. Item #13911: 18Kt. Yellow Gold Lady's Ring with 5x6mm Oval Ruby of .79 cts., ten Round Diamonds of .31 cts. TW and fourteen Tapered Baguette Diamonds of .21 cts. TW; Size 6 1/2. Item #15358: 18Kt. Yellow Gold and Platinum Lady's Ring with 6.4mm round Ruby of 1.45 cts. and two round Diamonds of .05 cts. TW; Size 6 3/4. Item #BK-RBY-0846: 14Kt. Yellow Gold pendant with 4x5mm oval Ruby of .34 Cts. and twelve round Diamonds of .11 Cts. TW. Item #12099: 18Kt. Yellow Gold ring with round Ruby of 1.13 cts. and ten baguette Diamonds of 1.07 cts. TW. Size 6. Item #13851: 18Kt. Yellow Gold ring with four square cut Rubies of .61 Cts. TW and five princess cut Diamonds of .69 Cts. TW. Size 5 1/2. Item #SC-PTRB-335: 14Kt. Yellow Gold Pendant with 2x3mm pear shape Ruby of .07 cts. and eight round Diamonds of .07 cts. TW. Item #BK-3738: 7" long, 14Kt. Yellow Gold Bracelet with twenty-two prong set 3.5mm round Ruby Cabs of 5.90 Cts. T.W. ; Slide clasp and safety. 20.44 Gms. T.W. Item #BK-2250: 7" long 14Kt. Yellow Gold Bracelet with twenty-two prong set 3.5mm round Ruby Cabochons of 5.35 Cts. T.W. ; Slide clasp and safety. Item #SC-EJRB-1-X1: 1/2" round 14Kt. Yellow Gold Earring Jackets with thirty-two round Rubies of 1.15 cts. TW (for 7 1/2-8 1/2mm gemstone or pearl stud earrings).